Having secured promotion the previous season courtesy of three straight wins, the firsts picked up where they left off with three more victories in the first five days of the new campaign without conceding a single goal. 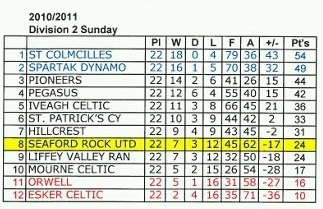 Although they suffered a setback against fellow Rockfield Park tenants Blackrock College, going down 2-1, they bounced back with a brilliant win over Hyde Park courtesy of a Dan Kiely goal, and a win over Transport a week later put them very much in the mix for a second straight promotion. And there was a very familiar look to the top of the Sunday Premier Division table, with Seaford once again battling against both Hyde and Tymon Rovers, who had occupied the top three spots the previous year. Tymon again held the Indian sign over Ronnie McLoughlin's side, earning a drawin Blackrock in September before comfortabling besting Seaford in the return fixture a month later. 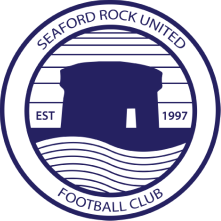 Seaford didn't play another league game until February, due to cup ties and bad weather, and if there was a little rustiness upon their return, they had the character to overcome it, which they demonstrated in two extraodinart back-to-back wins. Away at Wayside Celtic, Mark Hanratty and Shane Whelan both notched stunning goals, but the match seemed to be heading for a frustrating draw before youngster Kevin Glynn's secured a 3-2 with the last kick of the game when his long-range effort was deflected into the net. Next, away at unfancied Knockmitten, Seaford found themselves 3-0 down in the early minutes of the second half. But veteran fullback Kevin Healy's first ever Seaford goal sparked a brilliant recovery, as top scorer Barry Lyons added a brace to restore parity, before substitute Ian Nolan won a late penatly which Mark Hanratty nervelessly converted to steal the points. In contrast to the previous season, Seaford rather stumbled over the line, conceding a late equaliser against Blackrock after Glynn had been sent off, before Cabinteely produced a dominant display to secure a 3-1 win at Rockfield Park. But a pair of winning goals from Ciaran O'Sullivan, at home against Wayside and away at Dublin Bus, kept the promotion campaign on the tracks. Having been promoted to Division 2 despite finishing only fourth the previous campaign, the seconds initially found life tough going at the higher level. Goalkeeper Ian MacHugh would go on to be one of the club's modern greats, but his Seaford debut could not have gone any worse, as the seconds were thumped 5-1 by Hillcrest in the opening match of the season. In fact, Seaford mustered just four points from their opening eight matches, courtesy of Ciaran O'Sullivan's brace away at Mourne Celtic, and it seemed as if a return to Division 3 was on the cards. But consecutive away wins against Orwell and then St Colmcille's gave the side some hope. The latter win was especaially satisfying, as strike pairing Eugene Duff and Alan Henry tore the home side to shreds, before Collie Dolan curled in a stunning strike to seal a 4-3 win, which was secured by an astonishing reaction save by Mike Frawley. In truth, it was a difficult campaign for the seconds, but they enjoyed a brilliant April during which they picked up 10 points out of 12 to lift themselves away from the danger zone. Henry's first half hat-trick at Esker Celtic was a stand-out moment, before survival was ensured courtesy of a 5-0 rout against fellow strugglers Mourne. That meant the season's final game against Liffey Valley Rangers was a dead rubber, but it will always be remembered as the match when club legend Amer Herenda finally opened his Seaford account, at the end of his seventh season, before Collie Barrett headed in an equaliser in the final moments of the campaign. Smith, Healy, R McPhillips, o.g.